I’ve enjoyed the previous 8 books in the “Shadows of the Apt” series, but it has been a bit of an uneven series and some books have worked better than others. For example, the previous book “The Air War” seemed to spend too much time on the aerial battles and not enough time on characterisation. 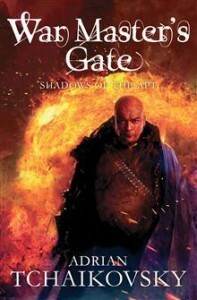 Fortunately, “War Master’s Gate” manages a better balance between the different elements. The book is split between two main plotlines. The first is the Empire’s latest attempt to conquer Collegium with Stenwold Maker leading the city’s defence while the second focuses on his niece Che’s attempts to thwart an expedition into the heart of the Mantis forests by the Wasp Empress Seda to try to gain the power of an ancient magician. Previous books have sometimes had problems when splitting the plotlines with one being more interesting than the other, but I think both plotlines work well in this book. One of the main themes in the series is the contrast between the two ways of looking at the world, the practical technology-driven approach favoured by the Apt people, and the Inapt worldview where magic and mysticism play a central role. The two plotlines show two different ways of waging war, the latest technology being used to besiege and defend Collegium while for the first time we see how Inapt magicians would wage war. The balance between the two could have been tricky, but the book manages to both clearly describe the technology and tactics of the Collegium plotline and also portray a more otherworldly setting as Che and Seda make their way towards Argatos’ tomb. The Inapt world works on a different sort of logic, but it does still manage to make a strange sort of sense and although the steampunk elements of the world-building have been inventive throughout the series, the more fantastical elements are becoming increasingly interesting. I think this is probably the first time in the series since the fourth book “Salute the Dark” where all the main characters in the series play a significant role in the same book and the series is clearly building towards its climax in the next book. Che probably gets the best plotline in the book and she has developed a lot as a character through the last few books with this book seeing her come to terms with her newfound abilities. The rivalry and conflict between Che and Seda does offer some of the book’s highlights, with Seda also getting some good characterisation – while she is one of the series’ main villains there are still glimpses of the more sympathetic character she was in the earliest books in the series. The Collegium plotline has another rivalry between Stenwold and General Tynan in command of their two armies, Stenwold is as reliable as ever in the series although it’s fortunate that the book doesn’t focus too much on him since he can be a bit too predictable to be entirely compelling as a character. Tynan is also an interesting character due to being intensely devoted to his duty to win the war while also being regretful about some of the things he has to do to win it. There are also plenty of good supporting characters with the ‘second generation’ of Collegium students being at the focus of some of the best scenes in the Collegium plotline. One of the few irritating bits of characterisation is Laszlo’s brainless infatuation with someone he knows is an enemy spy. Throughout the series Tchaikovsky hasn’t shied away from tragedy or from killing off characters and that continues here with probably the two biggest events in the entire series unfolding. The stakes are certainly high and with only one book to go none of the characters feel entirely safe, which does increase the tension. The book ends on a huge cliffhanger with the entire world seemingly in peril, while it doesn’t work as a standalone it is a perfect set-up for the tenth and final book in the series although I am a bit worried that there does seem to be a lot of plot to cover in that last book. Despite the more epic parts of the story there are also some powerful scenes on a smaller scale as various characters and peoples try to survive in a world at war, with the Mantis-kinden’s increasingly desperate attempts to find a place in a world that has left them behind being particularly tragic. Overall, I’d say this is a contender for being the best books in the series, it’s a very entertaining read and I can’t find anything more than minor flaws in it.